Every spring and summer, the children of Beijing have flown beautiful kites on the currents of wind that blow through the capital. Among the kite designs, the golden-winged swallow is traditionally one of the most popular. 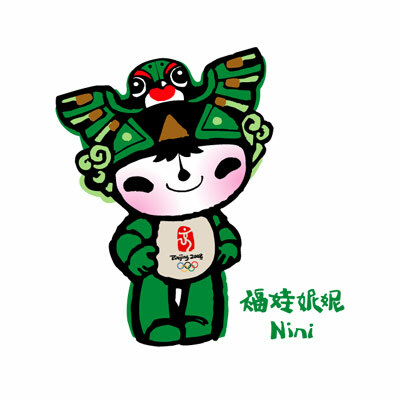 Nini's figure is drawn from this grand tradition of flying designs. Her golden wings symbolize the infinite sky and spread good-luck as a blessing wherever she flies. Swallow is also pronounced "yan" in Chinese, and Yanjing is what Beijing was called as an ancient capital city. Among the Friendlies, Nini is as innocent and joyful as a swallow. She is strong in gymnastics and represents the green Olympic ring.